A black bear in upstate New York whose head was stuck for at least three-and-a-half weeks in a food jug that once contained cheese puffs, or, perhaps, pretzels, has been rescued from his predicament. 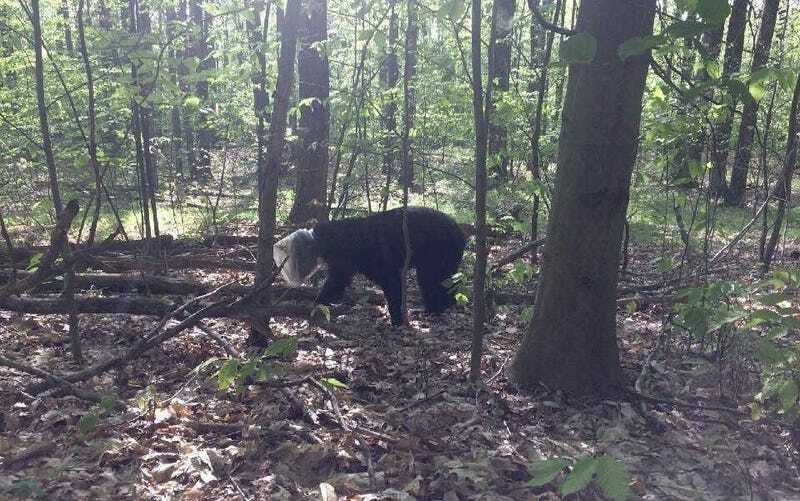 State wildlife officers received their first report of the bear, nicknamed “bucket head bear,” on April 24, from a woman who claimed she’d seen a bear in her yard, and its head was in a bucket. On May 19, Environmental Conservation Officer Andrew McCormick and some wildlife biologists located bucket head bear, captured it, tranquilized it, and removed the bucket from its head. Except for the tranquilizing part, this will make a great nursery rhyme some day. But at what cost? A bear no longer has a bucket on its head. A bear has no name. Also, have a good weekend and don’t litter in the woods!